It’s absolute Pandamanium at the zoo today with all of the panda’s thrashing at their cages demanding sticks of bamboo and free spin bonuses. It’s your job to tame them and learn what really makes them tick. Therefore you must get inside tiny brains by gaining some experience on this online zootopia of a 5 reel online slot game. Match Pandas and Zookeepers to accumulate paylines and earn yourself some significant cash rewards and bonuses. 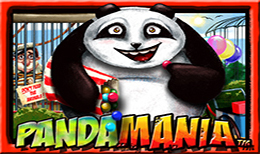 Pandamania is a zoo themed slots game with 5 reels and 25 pay-lines available on mobile, tablet and desktop. The game is set specifically around pandas; with cages, a waterfall, and a pedal cart making up the background on which the slots are seated. The symbols used for the reels are, you guessed it, pandas. In order to play the game, you must first set your wager. This is done by selecting the number of lines you wish to play by using the up and down arrow buttons, and setting the coin size (0.01 to 2) using the second set of up and down arrows. Wagers can be from £0.25 to £50 a spin. The “Heart and Clubs” button activates the gamble feature, and the autoplay feature is activated using the two arrows circling each other. The autoplay feature is used to set the reels in motion for a set number of spins without needing input from the player. When not using the autoplay feature, the player can start the reels my using the “play” button. Pandamamia’s gameplay is unique in the fact that it gives the player a huge amount of opportunities to win big. -The Panda Escape Bonus: This can appear at any time during the base game and free spins feature. In this round, a pandawill cycle with its cart across the screen, adding one or more Wild symbols to the reels. After this event is triggered, the reels are reevaluated for possible wins. This feature occurs more often during the free spins feature. -The Pick Me Bonus Round: This is activated when you land the padlock symbol on reels 2, 3 and 4. This round gives you the chance to win an instant prize. There are three possible prizes, all of which depend on your stake. The prizes consist of cash, a “Pick Again” symbol, and a “Win All” symbol that allows for all prizes to be revealed. -The Gamble Feature: This feature can be enabled each time you land a winning combo by using the “Heart and Clubs” button. This grants you the possibility of doubling or quadrupling your winnings, or losing everything. The wild symbol in this game is a happy looking panda holding candy, and can substitute for any and all symbols excluding the scatter symbol and the pick me symbol. When the wild symbol substitutes for any symbol on the reels, all wins including it will be doubled. It can also make its own winning combination if you manage to land two or more on a payline that you have enabled. The Scatter symbol is the game's logo on a wooden sign. The symbol can form scatter wins, each of which is multiplied by the total amount wagered. If 3 or more of these scatter symbols appear on the reels, you will activate the Free Spins feature. All in all, Pandamania is a uniquely fun game with many enjoyable features, and I recommend it if you want to spend an hour or two playing a cute slots game.